Hey, credentialed technicians! Are you looking to advance your career? This “Tech Talk” brings you the information you need to obtain a veterinary technician specialty (VTS) license, registration, or certification, as well as one technician’s experience, in her own words. Your Veterinary Technician Specialization—Where to Begin? If you work in laboratory medicine, the American Association for Laboratory Animal Science has 3 levels of certification in the laboratory animal field: ALAT (Assistant Lab Animal Technician), LAT (Lab Animal Technician), and LATG (Lab Animal Technologist). If you’re interested in pursuing an advanced degree, evaluate the expertise you already have that qualifies you to participate in one of these programs. If you have an interest in practice management, the Veterinary Hospital Management Association offers certification to become a certified veterinary practice manager (CVPM).The VHMA notes there were only 310 active CVPMs as of October 2012, so earning this certification will likely give you an advantage not many in the industry have. You might also consider certification as Professional in Human Resources (PHR) or Senior in Professional Human Resources (SPHR), both offered by the Human Resource Certification Institute. Although these certifications are not specific to veterinary medicine, managers who work in veterinary hospitals have found them to be beneficial. Pain management certification can be obtained through the International Veterinary Academy of Pain Management. 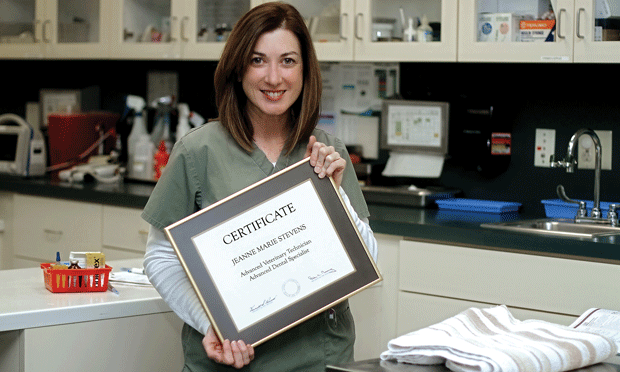 The Certified Veterinary Pain Practitioner title, which is unique to veterinary technicians and veterinarians, represents a dedication to pain management. Technicians can also earn an ultrasound certification through Sound Technologies. Websites for these can be found in the handout. Last but not least, you may find yourself passionate about end-of-life care. The Pet Loss and Grief Companioning certification may be ideal for you. Insightful information about this certification is available from Two Hearts Pet Loss Center. Have an associate’s (or bachelor’s) degree in veterinary technology and/or RVT, CVT, or LVT credentials as a veterinary technician or an international equivalent. Have completed a predetermined number of work hours in your specialty. Have proof you’ve mastered a set of advanced skills, including written documentation of cases (typically 2-4) that demonstrate your skills in, and advanced knowledge of, your specialty. You will be required to take a board exam, which is the final process in the certification. If you’re interested in pursuing an advanced degree, evaluate the expertise you already have that qualifies you to participate in one of these programs. For example, if you are a critical care registered veterinary technician (RVT) who admits patients, places catheters, obtains blood pressure, runs lab work, places arterial and central lines, monitors patients for complications and meet all other requirements of the specialty academy—you meet the criteria! Alternatively, if you perform dental exams, dental prophylaxis procedures, take dental radiographs, perform anesthesia and so on...you too may be qualified. So, think about your day to day responsibilities and investigate your options to see what you need to do to qualify for advanced opportunities. Want to learn more about advanced certifications for veterinary technicians? Use Facebook to connect with other technicians and learn from those who’ve gone ahead…or share your own experiences!